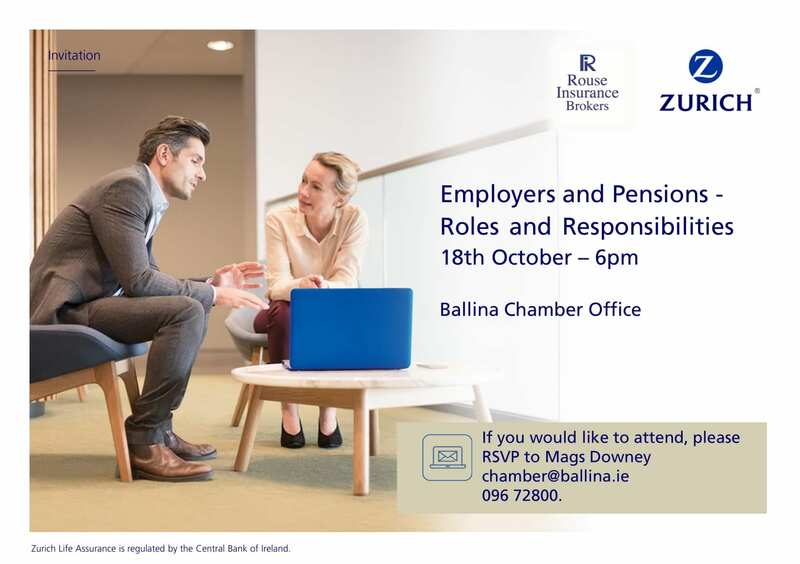 Ballina Chamber of Commerce is delighted to be hosting an Employers and Pensions – Roles & Responsibilities Seminar delivered by Zurich in conjunction with Rouse Insurance Brokers. Pension reform is a thorny and complex issue, as criticism of the Government’s plans to iron out the anomalies in the State system and bring it up to date have already demonstrated. Nonetheless, the Government is right to face up to its responsibility to reform the pension system and make it fit for purpose. Increasing life expectancy has made it imperative that action is taken now. There is no easy way to sort out the anomalies but the argument for a total contributions system is overwhelming. With technical experts discussing Personal Pensions, PRSA, Executive Pensions Arrangement and market commentary, followed by a Q&A session afterwards. In conjunction with this seminar Tracey Glacken, CPA, Glacken Accountants will present An Overview of Popular Tax Topics. Tracey has contributed many reports and blogs on taxation; personal and business and has worked with small to medium sized business helping them in the areas of audit, accountancy, taxation and dealing with the banks and revenue on their behalf. Tracey specialties in the retail industry, professionals, not for profit companies, charities, revenue and bank negotiations. Read Tracey’s’ Budget 2019 A Synopsis, report on how Budget 2019 will affect us all in the coming months. Please confirm your attendance at this event, as Pre-registration is essential. Please contact Ballina Chamber 096 72800 or chamber@ballina.ie to register for this workshop.